"In the world of comedy, it's sink or swim." 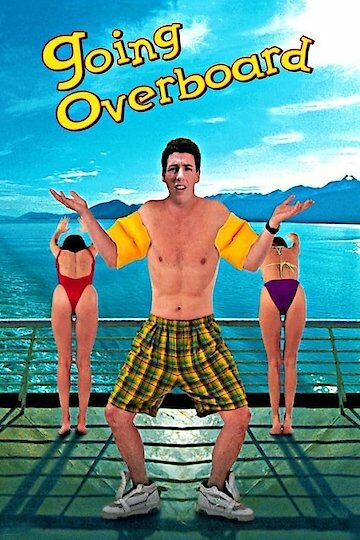 This comedy concerns a young aspiring comedian, played by Adam Sandler, who is making ends meet by working on a cruise ship. When the ship's comedian is incapacitated, Sandler's character gets the opportunity to put his comedy to the professional test. Eventually, he even gets the chance to be a hero. The film co-stars Burt Young and features an appearance by Milton Berle. It was co-written and directed by Valerie Breiman. It was originally released in 1989, before Sandler's star had begun to rise, but it was re-released in 1996 to take advantage of the then-popular Sandler's higher profile as a film star. Going Overboard is currently available to watch free on Tubi TV and stream, download, buy on demand at Amazon, Vudu, FandangoNow, iTunes, YouTube VOD online.